Echipa AVmall incearca sa mentina acuratetea informatiilor din acesta prezentare. Cu toate acestea, in anumite cazuri, pot aparea mici inadvertente pentru a caror semnalare va suntem recunoscatori. Ne poti contacta oricand pentru a clarifica eventuale nelamuriri. Nu uita sa mentionezi in corespondenta ta numele exact al produsul. Fotografia produsului DVD Auto Alpine ICS-X7 are caracter informativ si poate sa difere de produsul real sau sa contina accesorii neincluse in pachetul standard al produsului. Specificatiile tehnice pot contine erori de operare si pot fi schimbate fara instiintare prealabila de catre producator, neconstituind obligativitate contractuala. The ICS-X7 is one of the world′s first mobile media products to take advantage of the MirrorLink™ standard, making it extremely convenient to use a MirrorLink™ enabled smartphone and its applications in your car. If you own a smartphone that is MirrorLink™ enabled, visit your phone manufacturer′s app store to download the needed software (additional charges may apply) and install it on your phone. Those great features make it the world′s most advanced mobile information and entertainment centre, with a brilliant interface optimised for smartphones and apps. From sound quality and media support to navigation, everything is first-rate. Since more and more users rely on their smartphone as the main entertainment device, the ICS-X7 does not feature a drive anymore. Navigation is part of the features which will be enabled when using a MirrorLink™ compatible phone, logically the connector for the standard navigation became obsolete. For the first time, Alpine offers a unit with support for Aha™ by HARMAN. Aha combines all things you need while driving in one smartphone app. It offers entertainment; location based information and even keeps you connected with your Facebook and Twitter feeds. As Aha is made to create the least driver distraction, therefore messages will be read out by a text-to-speech engine. The location based services are bundled in dedicated channels. Those are at present: Hotels, Hungry, and Weather. Once a channel is selected, information related to the present location is read out by a clear, easy to understand text-to-speech voice. On the entertainment side, there is a vast array of choices. Aha provides a choice of own music channels of different genres, news channels and podcasts of all kinds. Moreover SHOUTcast Radio is supported, offering thousands of free Internet radio stations from DJs and broadcasters around the world. If the user prefers a good book over music, audio books are also available. With the audio books and the Aha channels, the user has options like pause, resume, rewind 30 seconds and skip 15 seconds. Currently Aha is supported on iPhones. The app is available from the App Store free of charge. Whichever links and stations are created on the iPhone, the same choice will be immediately present on the screen of the ICS-X7. To keep you entertained in the future, the ICS-X7 will stay up to date with support for new phones and apps from the Alpine website. 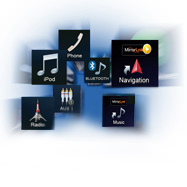 MirrorLink™ is a recently introduced standard for connecting smartphone devices to vehicle-based infotainment systems. It is a cross-industry solution supported by leading automotive manufacturers, system suppliers, consumer electronics manufacturers and handset manufacturers as part of the Car Connectivity Consortium (CCC). MirrorLink™ offers seamless and convenient use of smartphone-based applications such as navigation, music playback and other entertainment and communication apps. 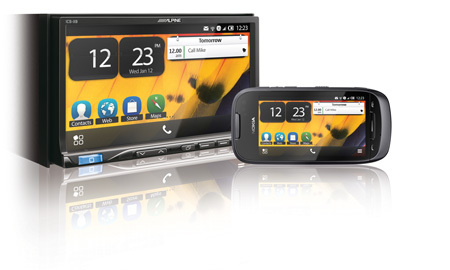 The ICS-X7 even features MirrorMode for Nokia, allowing the user to fully access and use all applications of a MirrorLink™ enabled Nokia smartphone in the car. If you own a Samsung Galaxy S3, download DriveLink from either Samsung Apps or Google Play to use your Galaxy S3 with the ICS-X7. Navigation lets you use your Google maps based navi app on your ICS-X7, while the music app allows you to select and enjoy all you music stored on your phone through your car audio system. The telephone app lets you make hands-free calls and easily browse your phonebook - all via the ICS-X7′s high resolution touch screen. You can even display new messages and have the unit read them to you via text-to-speech technology. Select from many pre-set answers − such as “I am driving” or write your own answer on the ICS-X7′s on-screen keyboard. If you own a MirrorLink™ enabled Nokia smartphone: Nokia Drive makes navigation free of charge, with always up-to-date maps and full touch control from the App Link Station. High-res maps are stored on the phone, eliminating data costs and the need for permanent connection. Advanced functions include online traffic information, destination search in online and offline modes, 3D views, music/video mute for voice announcements, menus and voice guidance in many languages. MirrorMode allows you to access all your apps installed on your MirrorLink™ enabled Nokia smartphone from the ICS-X7: stay up-to-date with your social network and IMS sites, listen to internet radio through your car speakers, get informed about the weather, use location based services, browse the web, enjoy your photos, read your mails and SMS, and much, much more…. For safety reasons, the ICS-X7 will allow the usage of these apps only while the parking brake is engaged. The fully customisable home screen provides smartphone-level animations. Controlling functions is smooth and easy via touch, drag and flick operations. Simply choose your favourite app from the homescreen and put it on the favorite app bar for fast access anytime. And everything is crystal clear on the 7” high quality WVGA display. Alpine gives you the ability to ultrafine tune the sound of your system with an amazing array of functions including 6-Channel Digital Time Correction, 9-Band Parametric EQ, 10 EQ settings, Digital Crossover, MediaXpander, and Subwoofer Level Control and Phase Selection. Get the most out of your iPhone or iPod by plugging it into one of the dual USB ports. Enjoying your stored music with high sound quality or movies on the large, high resolution display. The ICS-X7 provides iPod Cover Flow and a handy Quick Search function for finding songs, albums, artists and more fast. While you enjoy the music/movies your iPhone/iPod charges automatically. In addition to the basic benefit of hands-free phone operation, built-in Bluetooth gives you a wide range of very convenient functions. You get Simple Secure Pairing and can pair up to five phones. Enjoy A2DP audio streaming with control that is AVRCP 1.0/1.3/1.4 compatible. Advanced phone features include phonebook sync, alphabetic and percentage phonebook search, 3 favourite numbers preset and a signal strength indicator. With the ICS-X7 in your car, you have instant access to all the AV media you choose to use. You can connect your iPod, iPhone or Nokia phone to enjoy your stored music and access online music libraries. A USB port lets you plug in USB sticks and hard disks, and allows USB video playback as well as music. DivX, MP3, WMA and AAC playback are possible, and you can also connect a camera. Nu sunt recenzii pentru DVD Auto Alpine ICS-X7. Fii primul care scrie una!